Yevgeniya Zakhar from Ufa (Bashkiria, 720 miles east of Moscow) charges nothing for her hours-long work. Her clients receive more than just a beautiful body tattoo. Rising from her couch, they are full of hope for a new life and happiness. I’ve been in the tattoo business for 10 years. I used to draw a lot, and then started tattooing. It’s a fun and happening job being a tattoo master. There’s always people milling around the studio, grateful clients drop by for evening dos. Life’s for the living, I guess. 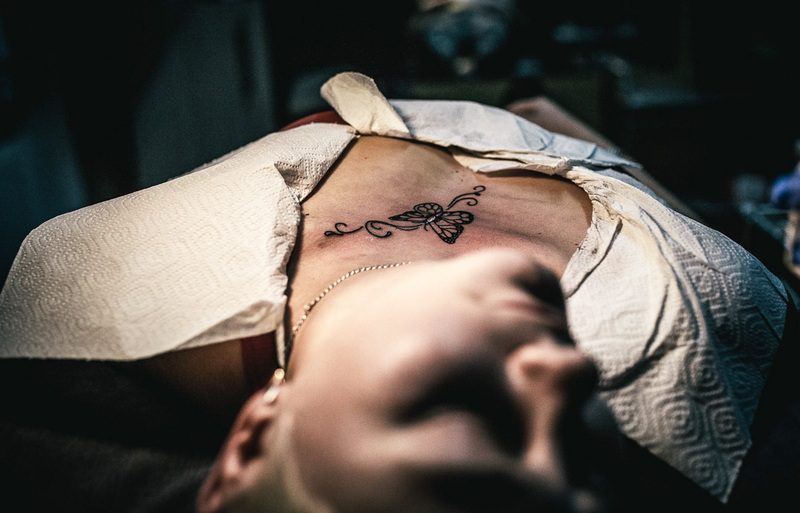 But one day I stumbled across an article about Flavia Carvallo, a Brazilian tattoo artist who helps victims of domestic violence cover up their scars, and thought to myself, why not give it a go? In my cheery little world, it didn’t even occur to me that so many women suffer from domestic violence. I’ve already seen about 100 clients. The main reason they come is to open up on the couch, tell their story and then forget about it forever. I heard so many stories it’s time to write a book. I try to be their friend and it seems to work. Many bring me thank-you candies. They tell me that two hours of pain with me helps them forget years of torment. I’ve had letters from all over Bashkiria. Young and old, calm and hysterical, you name it. They’re all united by one thing — pain. They all said that can’t look at their scars because they’re reminded of the day when their beloved man hit them. Viki’s ex-husband did jail time for this crime. On release he was killed, allegedly in a drunken brawl. Life with her man was never easy for Nadezhda, but one day he crossed the line. He grabbed her, pinned her to the bed and started stubbing a cigarette on her. Then he cut her arms with a utility knife. She had five sessions to get rid of the scars. A few are still left. Although each tattoo costs about 2-4 thousand rubles, I can’t take money from these women. That’s the way my parents raised me. Those who have money pay for it. But some clients obviously can’t afford it. I’ve got lots more bookings, about another 200. Domestic violence is like war, unfortunately. It’s never-ending.